"In our review, we have found bad to be stronger than good in a disappointingly relentless pattern. We hope that this article may stimulate researchers to search for and identify exceptions; that is, spheres or circumstances in which good events outweigh bad ones. Given the large number of patterns in which bad outweighs good, however, any reversals are likely to remain as mere exceptions." Just a few years after their publication the first, other researchers began identifying what seemed like an exception to the negativity bias. Charles, et al. 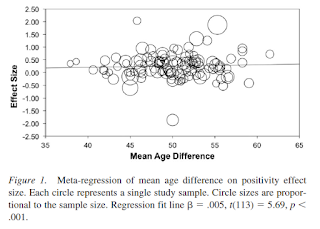 (2003) and Mather & Cartensen (2003) were among the first to discover that older people seemed less vulnerable for the negativity bias and perhaps even showed a positivity bias. Since, then many studies have shown similar things: that there seems to be an age-related positivity effect in attention and memory. However, there has been much debate about the nature and strength of this effect. Reed et al. 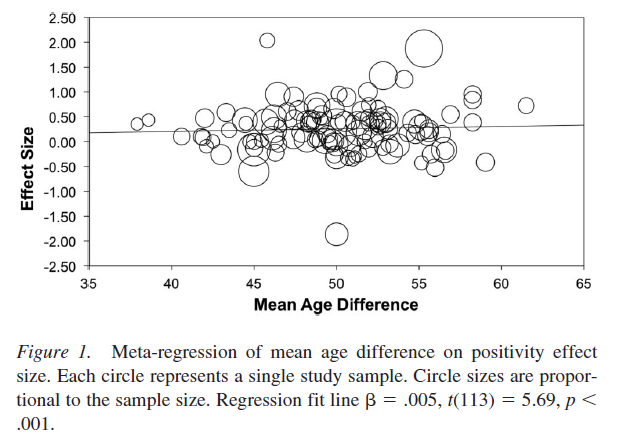 (2014) conducted a meta-analysis of 100 empirical studies (N=7,129) which conclusively showed that there is indeed an age-related positivity effect. Younger people on average tend to be more focused on and impacted by negative information and events, while in older people on average the opposite is the case. Cool. Did they offer any explanation? Yes, an explanation is offered by the socioemotional selectivity theory (SST) which says that "motivational priorities shift across the life span as a function of future time horizons. When individuals perceive their futures as relatively open-ended and nebulous, as in early adulthood, they tend to prioritize future-oriented goals such as acquiring information, meeting new people, and generally expanding their horizons. However, when individuals increasingly appreciate the fragility of life and future time horizons narrow, as is typical in later life, they prioritize present-focused goals related to emotional meaning and satisfaction. These systematic age differences in goal priorities consequently should alter information processing by shifting attention and memory toward goal-congruent and away from goal-incongruent material. Because older adults are especially motivated by goals related to emotional satisfaction, SST predicts an information processing shift toward positive information in later life."